Where Fun, Faith, and Family Collide! Here at Pearce, we desire to see every family in our community grow to look, live, and love like Jesus. We want our church to be a place where families feel welcomed and are able to encounter the love and grace of God. So, it is with great excitement that we want to announce our new approach to VBS, Mega Kids Camp: Where Fun, Faith, and Family Collide. 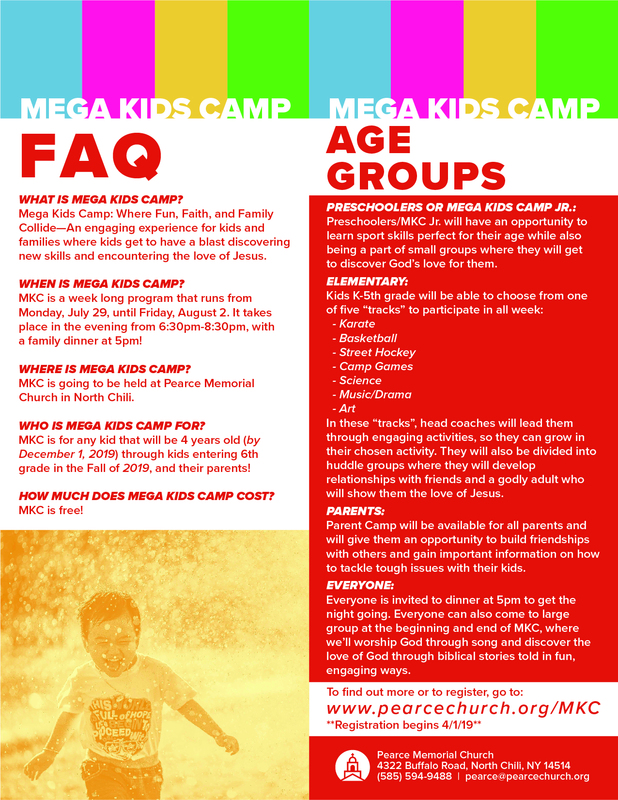 Mega Kids Camp is for kids entering Kindergarten-6th grade this fall (2019). When you register your child, you will have the opportunity to pick from seven awesome tracks: basketball, karate, street hockey, music/drama, camp games, art, and science. For the entire week, kids will learn skills in their chosen track and discover the good news that Jesus loves them. Mega Kids Camp, Jr. is for preschool kiddos (age 4-5 by December 1, 2019). They will learn skills perfect for them and encounter the love of Jesus. Parents, once you sign-in your kids, you can stay and participate in Parent Camp. Here you will build friendships with other parents and discuss important issues facing your family. Join the team—there are so many ways to serve at Mega Kids Camp! Be a coach for one of the five tracks. Lead a huddle of about eight kids in discovering how much Jesus loves them. Be a greeter. Help with registration or behind the scenes prep work. Set up and tear down the gym before and after dinner each night. Get to know parents who attend Parent Camp. Pray for this ministry and everyone involved!